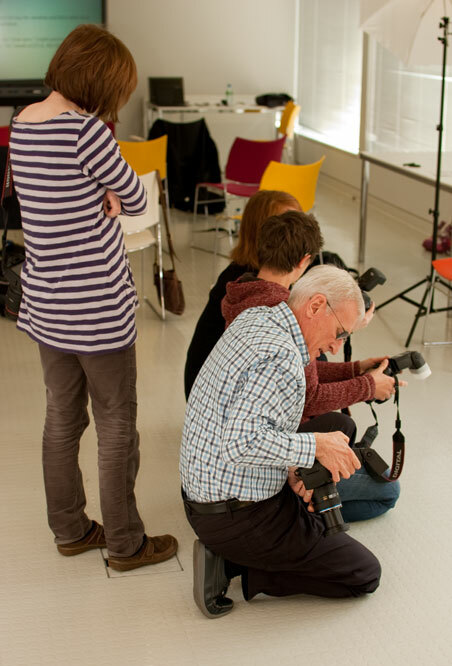 I spent the morning on a beginners portrait course. I wasn’t so much interested in how to take portraits because I’ve read quite a lot in books and magazines, and videos from the web. I was more interested in how the course was presented, and what kind a things were taught. There were areas that were interesting and I learned more about why f/2 is actually a wider aperture than f/16. Who’d have thought the ‘/’ actually meant ‘divided by’! Technical issues aside (when the laptop with the presentation failed), and the confusion over the start times, the course was ok, but I think there would be better ways to teach it. Maybe I should have a go. The photo is of my fellow students in action. No… I don’t actually have a portrait photo.